Getting to the Monomoy Point Light is one of the best and most challenging adventures but is well worth it. To get to the lighthouse, visitors must take a forty-five-minute boat tripfrom Chatham. There is no dock on the island, so visitors must jump off the boat into knee-waist deep water, retrieve their gear from the boat, and wade to shore. The lighthouse is located about a mile or so inland. There are no roads, sidewalks, buildings, or vehicles on the entire island, so prepare for a hike. Monomoy was once a peninsula reaching southward from Chatham at the elbow of Cape Cod's bending arm. It is now two islands, North Monomoy and South Monomoy. This is due to the many storms on Cape Cod over the years and the resulting erosion. 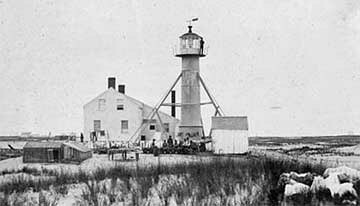 A village started up at Monomoy in the early 19th century, centered around the fishing industry and the increased traffic then warranted a lighthouse. In 1823, Cape Cod's fifth lighthouse was built at Monomoy Point, (also called Sandy Point), eight miles from Chatham near the south end of the peninsula. 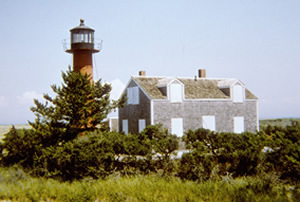 Like many early lighthouses in the area, it was a Cape Cod style light with a wooden tower and iron lantern room on top of the roof of a brick keeper's house. The lantern had eight lamps with 13-inch reflectors. The present cast-iron brick-lined tower was built in 1849 after the original was found to be in such disrepair. The lighthouse received a fourth-order Fresnel lens in the mid-1850s and there was a recommendation to upgrade to a second order light in 1872--which did not happen. The lighthouse was then painted red in 1882, making it more visible by day. In 1892, iron trusses were added to the tower to prevent vibration. With the opening of the Cape Cod Canal in 1914 and an increase in the power of Chatham Light, the Monomoy Point Lighthouse was considered expendable. The light was discontinued in 1923 and the property fell into private hands. One of the owners came to visit the property and was surprised to find that Navy planes had been using it for machine-gunning target practice. 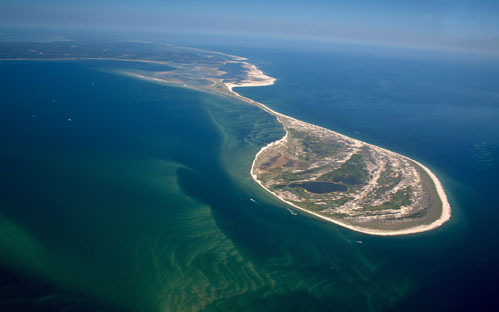 Today both North and South Monomoy islands are run by the U.S. Fish and Wildlife Service. The Cape Cod Musuem of Natural History has offered hikes to the lighthouse and overnight stays in the past, but the programs have been discontinued. The best way to visit is via the Monomoy Island Ferry.